Baba Akote was born in 1965 in Akote, Niger State, Nigeria. He is multilingual in Nupe, Hausa and English. Variants of the Nupe language are spoken by more than a million people in Nigeria, mainly in the north-central part of the country known as Niger State. A graduate of Ahmadu Bello University, Zaria, Baba Akote also holds a B.Ed. in Language Arts (English), and a postgraduate diploma in Mass Communications from Bayero University, Kano. 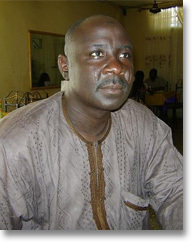 He is author of The Moving Cloud: Verses for Children, 1999, and in the same year, he co-authored The Spider and Other Stories, with B. M. Dzukogi, Abdullahi Ismaila, Saidu B. Musa and Lucky Ogwughvu. His writings have also been included in two anthologies: ‘Dead Dreams’ in Dance Steps of Dawn, 1997; and ‘The Yellow Bill’ in Cramped Rooms and Open Spaces, 1999, both published by the Association of Nigerian Authors. After serving the Association in various capacities, he is currently Chairman of the Niger Branch. He lives in Minna and works as assistant registrar at the IBB University, Lapai, Niger State, Nigeria.